The Adventures of Tioga and George: Where to be? 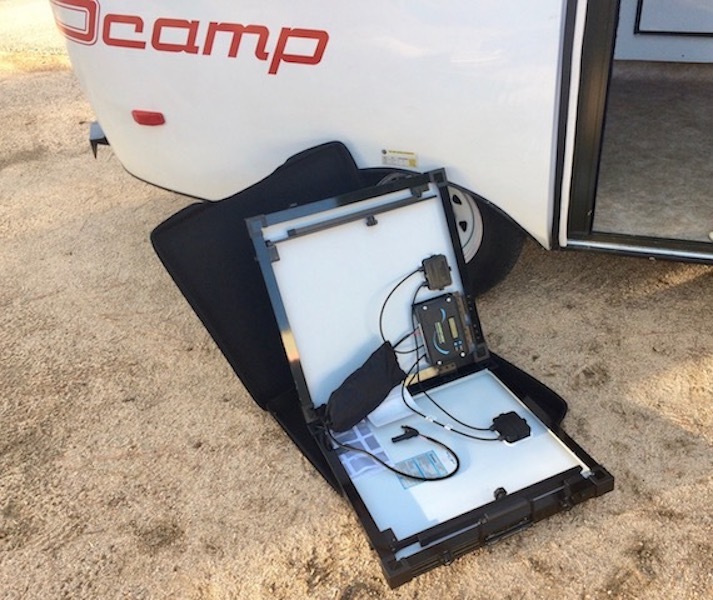 on-the-road with Little Scampy is about equal! Wow! I believe that I must give this thing a whole lot of thought in order to understand what this means and how it will affect me. Baby Boid free and flying! One of the first things done when we arrived at Lone Wolf, is to bring Baby Boid in his cage to his place inside Twayler. As you may know, Boid's cage door is always open while Boid is inside Twayler. Boid is a very contemplate creature. When his cage door was opened, he did not immediately go out the door and fly around. Boid watched closely as I opened his cage door. Then he went down and stood close to the open door. Looking out but now going out. Then he returned to a higher perch and stayed there for about 10-minutes. We believe that this contemplating business is part of Baby Boid's curious and cautious nature. I was sitting in the La-Z-Boy next to Boid's cage opening mail. Suddenly Boid took off, flying very fast, up and down the length of our living room several times. Then he landed on his cage and tweeted up a storm! After a bit of this tweeting, Boid flew over to the window with the ledge. One of his favorite places. And looked outside. Baby Boid is a wonderful traveling companion. In his own way, he talks to me. He looks at the things outside as we go. And often gets very excited, bobbing his head up and down while tweeting. Boid is fascinated by traffic. When we are in heavy, bumper to bumper traffic, Boid makes a different kind of low toned tweet sound while looking at the cars. As much to say, "Why are all of those cars so close together?" 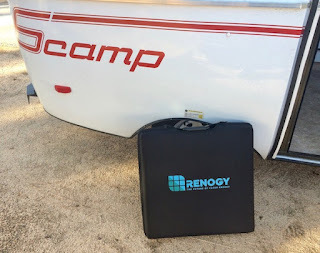 While on our Scampy Trip, a solar panel was ordered from Renogy. The Renogy 100 Watt 12 Volt Eclipse Solar Suitcase is an entire solar power system incorporated into one small package. Made with the most efficient monocrystalline solar cells Renogy has to offer, this unit weighs a mere 19.40 lbs. This lightweight suitcase includes two 50 Watt Monocrystalline Solar Panels, one 30 Amp Adventurer Charge Controller with an LCD Screen for power regulation, one 10ft tray cable with alligator clips for easy connection to the battery, one temperature sensor, one battery voltage sensor, and a protective casing for safe portability. 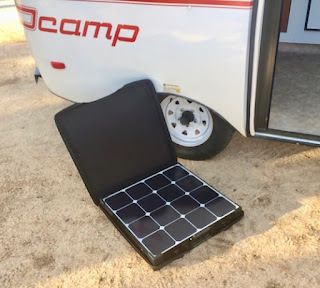 Showing how nicely Solar Panel fits into case. Easy to load and remove from case. connections, tilting legs and battery charge controller. tilting and rotating for best position to the Sun. 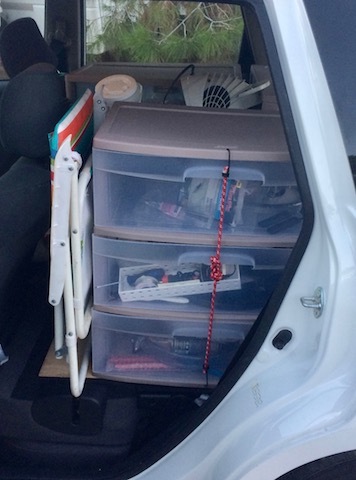 Just a few minutes ago, we completed the first stage of Honda's storage straightening. Every thing that is going into the cabinet's drawers is now in there. I don't believe that we Blogged about buying a pair of saw horses at Sears the other day. Those two saw horses are in there too! Neatly stored between the cabinets. With those saw horses, we are able to do wood working out on the road! 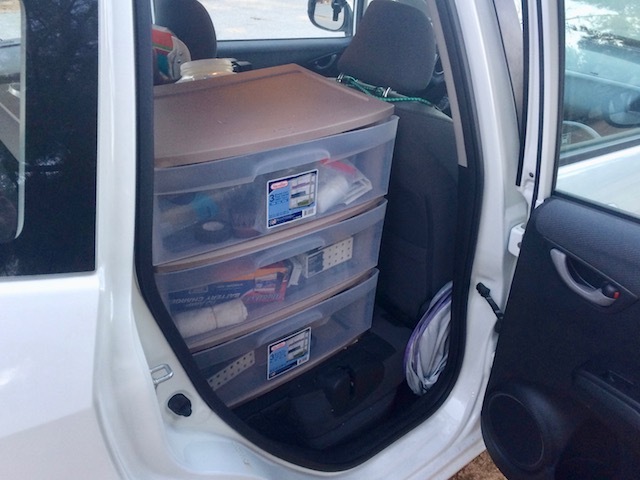 In the pics below, you may view the saw horses in the hatch door pic. 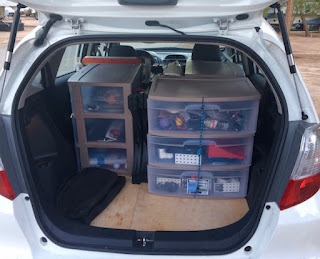 Look at the mostly clear floor area in the hatch view! Pretty neat, huh? the right and left cabinets? Do you see our beach chair? Tomorrow we intend to go thru all the storage drawers to sort out the proper location of stored items. For example, all the electric tools together. All the hand tools together. However, the way stuff is in the drawers now, mostly unsorted, I've noticed how much easier it is to find things. I am sooooo happy how this project turned out! A Giant Thank You to Reader W3 without whom this project would not have turned out sooooo grand! I guess time will tell. Best to play it by ear, me thinks. I'm having a good time here. Made breakfast. Two over-easy eggs and Jewish rye toast. Oroweat makes Jewish Rye that stays fresh forever. Great taste! This rye bread makes into wonderful French toast. Boid is sooooo relaxed! Right now, he's standing on one foot. He may be a bit tired from all that has been going on lately. I love my home but also love to travel. At the end of a trip it's so good to be home for lots of reasons but mainly it's home, home. I agree with you sooooo much! Home is just plain good! Hey George, our new parakeet is getting antsy inside his cage - appearing to want to fly around. But he's still not finger trained. Think it's ok to let him fly around the house anyway? Should we expect him to return the the open cage on his own? It's OK for you open Buddy's cage door. But you would be wise to do that opening in a bedroom or your office room. Where you may restrict his flying to keep him from getting into trouble. When Buddy is out of his cage and free to roam the room, he should return to his cage when tired, hungry or thirsty. PS: It is very likely going to take several months for Buddy to come to trust you enough to on his own fly to you. But when he does trust you that way, he will love you sooooo much! He will walk on your head and on your shoulders. Touching you with his beak. You will both love the way Buddy comes to interact. We love our home in Canada so much that we hate to leave in the RV each fall and drive down to Mexico. Come spring we love our place here on the Isla so much that we hate to leave it to return to Canada. I call that the best of both worlds. 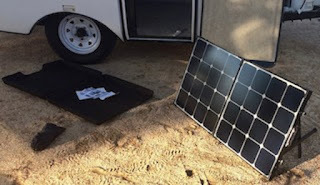 It may be that all of us RVers feel the same about leaving home to go on an adventure. And returning to home.